Trying to plan a wedding outside of the conventional format is no easy task; we wanted to do something different from the traditional ceremony/cocktail/dinner/speeches/cake/first dance etc format. We decided to surprise our families and friends over a 3-day week-end (keeping it relatively tight to 100 guests), and provided them with minimum information on our wedding: Land in Florence on Thursday afternoon, bring a bathing suit and a driving licence, and bring a Dolce Vita dress for Friday evening. Although we own a house in Tuscany and have become familiar with the region over the years, we contacted Chiara & Elena almost a year prior to the event to help us organise this three-day surprise wedding. In hindsight, we hadn’t realised at all the amount of work it required not only in terms of organisation but also in creating the relaxed and dolce vita mood over 3 days and 100 people. Chiara and Elena’s work was exceptional, and our wedding was beyond anything we could have imagined. An enormous thank you to both of them. We stayed at the Borgo di Pietraffitta. Chiara & Elena organised each event and meals in a different place within the Borgo. It was stunning, the staff was extremely nice, very friendly, and provided a wonderful atmosphere. Chiara & Elena set up lighting and flowers which provided a wonderful Dolce vita atmosphere, simple and authentic. Amazing food for 3 days period. From the picnic baskets provided for the rally to the wedding cake, it was fantastic. Wonderful rally, beautiful roads, good timing, and very special memories for everyone. Finding a village suited for the wedding ceremony, that can park that many cars, and who’s mayor accepts to wed us on the plaza. Finding a special place in Florence for a private concert and cocktails on a Saturday night with a special view point of Florence (and again authentic). The world cup quarter-final with France playing, made us skip the church visit at the last minute. Chiara & Elena organised an outdoor theatre with a large TV screen for 60 guests in a heartbeat. The list certainly goes on, and we are grateful for all the work that Chiara & Elena did so well, for finding special places, and putting together so many outstanding teams in varied fields (catering, transportation, staff, guides, etc). All of the above made for a very very special wedding and possibly the best week-end for a number of us. But most importantly, Chiara & Elena provided the warm & relaxed atmosphere for our guests to best enjoy this special moment for us. And that’s something we’ll never forget. 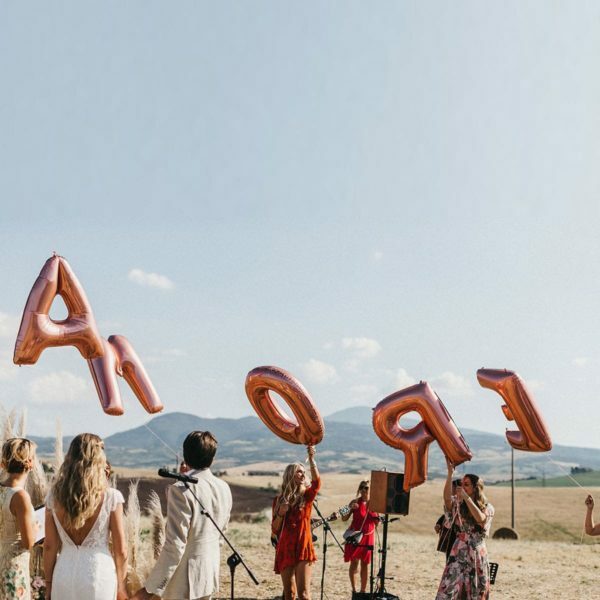 Chiara and the WeddingsInTuscany team planned our dream wedding in September 2018. Words cannot describe how perfect the experience was and we feel so proud to have Chiara guide us through it. We made two trips to Florence prior to the wedding. The first to select our villa and the second to choose our caterers and florist. Both trips were amazing and we would really encourage any couples to try and visit before the ceremony as there is no comparison between seeing your venue in person versus looking at photos online. We also really valued the opportunity these trips provided ourselves and Chiara and Elena to get to know one another. This really helped to create such a relaxed environment for us and helped to tailor the style of the wedding to our taste. From these conversations with Chiara and Elena we also got familiar with Tuscan wedding traditions and styles and were happy for many of these themes and elements to be captured in our wedding. Our ceremony was completely bespoke and tailored to us, it made our day so unique and Chiara and Elena guided us through it. Apart from expected wedding day nerves we were both so relaxed and able to focus on enjoying the best day of out lives. Elena conducted our blessing and delivered the readings and vows so beautifully and made the whole experience very personal. Both ourselves and our guests were in awe of the experience that Chiara and the team had created – the ceremony in the garden, the backdrop of the beautiful Tuscan countryside and the incredible dinner setting. We could not have wished for anything more. We are so grateful to Chiara for the part that she has played in our wedding. Chiara is an amazing designer. Her work is full of style and class and this is why we picked her. The biggest compliment we can provide is that both ourselves and all of our guests had no stress at all from start to finish. Chiara and the team had taken care of everything and the execution was flawless. We can’t imagine how any other wedding planner could do a better job than Chiara and her team. A little over a year ago, Chiara was simply our wedding planner. Now she is a great friend. we are back from the holidays. Sorry that I write you only two weeks after the wedding. In Africa, internet connections were very bad. How should I describe such a wedding planner, if I miss the words, you are incredibly professional, your work made with a lot of love and art, unique, perfect to the smallest detail. the result is a perfect organized wedding from the best person i will be grateful for a lifetime. I thank you from the heart for all these great moments we were allowed to live, I thank you for everything you have done for us. It was a magical and dreamlike experience. I don’t think that Mirdon and I have read enough books to be able to build sentences that would truly express the gratitude in our hearts for of you who organized and supported our wedding you are an excellent wedding planner, you made the impossible possible and the joy we felt that night We have years to go before we will know for sure, but that night definitely felt like it marked the happiest moments in our lives. We wanted to be right where we were— surrounded by the people we love the most. Each person that we met eyes with, cheered with, hugged, took pictures with, and mainly danced with brought us so much comfort and contentment, tranquility and felicity, and most of all, made us feel blessed. A dream came true, thanks to you dear Chiara. Firstly, a huge thank you to Chiara & Elena for the most memorable week of our life. Russell & I and all our family and friends had the most magical time, everyone is still talking about how fabulous it was to this day. Words cannot possibly describe how exquisite it was, from staying at the superb Villa il Santo overlooking the Semi Fonte valley to the fairytale town of San Gimignano, the wine farm Dolce Vita welcome Lunch, to the stunning venue for the wedding ceremony at the magical medieval hill top village of Certaldo Alto, we could not have asked for a more perfect week. We decided on Italy as our wedding location as we had family and friends coming from all corners of the world and it seemed like the most central romantic location. Also, I have had a love affair with Italy ever since I visited as a student in 1990. Organising a wedding in a foreign country is complicated, we both work full-time in Dubai and needed help with all aspects of the wedding week planning, from the venues / décor / catering / hair & makeup / transport and legal side, hence we did extensive research to find an appropriate Italian wedding planner who had great experience, knew the area and spoke the language. We contacted Chiara and after our first Skype conversation knew she was the one to do this for us. We immediately organised a trip to Italy to meet with her to go through all the details. Our brief was simple, we wanted a relaxed, rustic Tuscan style wedding in a local medieval Town Hall with the reception dinner in the garden at the villa we were staying at which could cater for around 70 guests. We required a traditional farm house style 8 bedroom villa for the wedding party for the week, plus nearby accommodation for all our guests – Chiara arranged a number of villas for us to look at, all of which were stunning, plus she recommended a variety of local villas and hotels for our guests from low to high end to suit each of our guests budgets. – I highly recommend this villa, the owners are so welcoming and wonderful. Once we were in Italy for our initial meeting, Chiara organised meetings with 2 different caterers, where we had the most exquisite food and wine tasting, we went through all the table settings and met with the florist to brief the wedding flowers and bridal party bouquets. We even requested a Scottish Piper which she found for us too, living in Italy believe it or not. The most stressful time we had was sorting out the legal paper work. Russell being South African and myself British, both resident in Dubai, getting legally married in Italy was not an easy task, but Elena was a super star, she definitely had her work cut out, but it all ran smoothly in the end. We decided to have the actual wedding ceremony in Certaldo Alto Town Hall, which is the most magical and historic venue, following the Scottish Piper up the medieval narrow streets with my Scottish father to the town hall was an emotional and surreal experience I will never forget. The streets were lined with tourist and locals clapping it was really something else. Words cannot possibly describe how wonderful our wedding week in Tuscany was, we highly recommend Chiara and Elena to anyone wanting to have the most exquisite wedding experience and take the stress out of the organisation. We returned back to the USA yesterday afternoon and cannot stop thinking about the absolutely amazing time we had in Italy with our family. The vacation was wonderful and the wedding was the icing on the cake. Brian and I cannot thank you enough for everything you did to make our wedding absolutely perfect & like a fairytale! From the first day we started working with you we felt at ease. You recommended fantastic vendors, kept us on board with next steps and payments and were all around lovely. The morning of the wedding we both felt relaxed and not worried about anything. She and her assistant were wonderful. Kind, Calming and so talented. Having the van take us allover on our wedding day was perfect. Montepulciano was beautiful and having the ceremony there worked out beautifully. Elena was fabulous too! We loved walking the small streets and having people stop us to say, “Sposa” and “Augurio”. It was a bit surreal. The location was perfect and the views spectacular. It was nice to take a moment after the ceremony to share in the excitement with the family. We haven’t seen their work yet but they were a joy to work with. We loved how Elisa kept telling us to get closer. It made Brian and me smile a lot! Even though there was a little chaos with the smoke bombs we expect those photos to be priceless too. We know they were not the easiest to work with but in the end everything was spectacular. The location was exceptional with the cocktails on the one level and dinner on our own patio. Each course was more beautifully presented than the next and tasted like perfection. The cake was not only beautiful but one of the most delicious cakes I have ever tasted. The views and sky that night could were like a painting. We appreciated you making sure that the cake slices came out with the sparklers in them. This looked so beautiful! You never missed a beat with any detail. We knew this one would be hard for Donna since she used to design weddings but again everything was perfect. The two bouquets and the centerpieces were the exact mix of naturalness and elegance. The centerpieces were truly lovely with the mix of herbs and floral arrangements in terracotta pots and glass vases. All of the candles added the most beautiful lighting. At one point, we thought that music would not be needed but it absolutely completed the evening. The trio was fantastic and set the exact tone that we were looking for at the wedding. Our guests commented on how wonderful they sounded. We are excited that Weddings in Tuscany will be featured in the magazine and cannot wait to receive the link from the photographer. We believe you said we would have it by Friday. We will also email each of the vendors and thank them for their exceptional work. Thank you again for everything. Your attention to detail was exceptional and you made our day one we will never forget. We found Chiara after searching and speaking with a ton of other wedding planners. The most important things to us was finding a planner who we got along with, whose design aesthetic we liked, and was within our budget. We knew after speaking with Chiara for the first time via Skype that we liked her personality and vibe and would get along great. That was confirmed once we made our first trip to Florence to secure venues and vendors. It was the first time we met Chiara in person and we knew we had made the right decision that very first meeting. She was so friendly and made us feel really comfortable working with her. Chiara (and her business partner Elena) never pressured us or made us feel forced to choose or agree to anything that we weren’t happy with. I think a lot of people in the wedding industry forget that wedding planning is a completely new experience for most couples and need help navigating every part of the process. She never seemed bothered to answer our thousands of questions or to give us guidance or advice. As for her design aesthetic, I think her portfolio speaks for itself and was the main driving factor in us choosing to work with her. Her weddings are absolutely gorgeous. We trusted her creativity and experience, and she gave us great options for flowers, lighting, decor, table scape etc. It really just came down to what we liked better at the end of the day. We ended up booking a venue that could accomodate our entire wedding, including 2 nights stay for all 50 of our guests – not an easy feat. While we were pretty involved with that process, Chiara took charge on the areas where we really needed help like pricing, rehearsal dinner, and day of planning based on our needs. As for the wedding itself, we were worried because all our events were supposed to be outdoors and there was rain in the forecast. We obsessed over the weather in the days leading up to it, but Chiara was super calming and came up with plan b & c options. We ended up having to go with plan B, but it ended up being amazing and honestly, better than we could have hoped for. After 7 months of speaking with her every week leading up to the wedding and then suddenly not having that constant communication after the wedding, we’ve realized how much we miss her! With that said, she has been incredibly responsive and helpful lying up any loose ends after the fact. She’s genuinely an incredible wedding planner and an equally incredible person to know. After our wonderful wedding we really enjoyed our honeymoon in Italy. We needed some time, to process everything. That’s why we’re writing now. We will probably think back to this day our whole life. We had two magical and unforgettable days in Buggiano Castello. The guests harmonized like a big family, the place and the location were perfect, the church, the garden, the terrace a perfect interaction. The performance of Michael, Claudio and Luca could not have been better. Everyone felt very well. We have never experienced something like this. We would like to THANK YOU and your team for having been with us for more than a year and realizing our ideas. We really appreciate your support. Ciao Chiara, grazie mille per tutto!! It was just wonderful and we really enjoyed the day very much!! You and your team did such a great job!! We left a little present for you, Elena and Francesca.. Irene will give it to you by chance!! I hope you’re well! Sending you this email to thank you again for everything you did for our wedding, you helped make our day truly amazing! We still can’t believe how special it was. The effort you made before and on the the day was unbelievable, we didn’t expect you to stay so late!! I can’t think of one guest that hasn’t said this was the best wedding they had ever been too and was an unforgettable experience. Many of them mentioned how great you were on the day too. Holly and I have mixed emotions at the moment, excited to be married but sad that the wedding day is over! Nevertheless, we will look back with incredible memories! Holly is going to send you some photos our guests took and we will be sure to send you some of the professional ones as well. Good luck for your other weddings this summer! We wanted our wedding journey to be simple and enjoyable without all the stress of planning. We found you on online and you gave us Elena and all our wedding dreams came true! What we appreciated the most is that you listened to us and our wishes for a small intimate relaxed wedding and helped us live it. Elena your presence on the day and throughout the planning was amazing. You made us feel comfortable and relaxed like we had known you forever! Now we are back in Melbourne Australia bragging about our Tuscan get away wedding as if it was from a movie! You are guys are a dream come true and we could not be happier in finding Weddings in Tuscany! I must say it can be quite nerve wrecking planning a wedding overseas, but Chiara helped from the very beginning and was invaluable through every step along our planning journey. Our search began online and we had Skype interviews with prospective planners. When we spoke with Chiara we were immediately impressed with her depth of experience and creative talent. From our early interaction and Chiara’s responsiveness to our questions we knew it would be a good fit. We were fortunate enough to plan a visit to Florence a few months after engaging Chiara. Prior to the trip we narrowed down our list of venues to 4-5 and she arranged the visits for us on one day. At each venue it was clear the proprietors have a good relationship with Chiara and she helped us to ask all the right questions. We can’t say enough about how wonderful Chiara and her team were throughout the planning process. Every detail was contemplated and Chiara offered exquisite recommendations when we sought her guidance on making selections. They also helped us choose an amazing venue for our rehearsal dinner in the Tuscan countryside. We weren’t able to see it in person, so their help to guide us was much appreciated. Francesca was great to work with on this and she also planned the transportation arrangements. Everything went perfectly and our guests raved about the experience and venue. Our wedding ceremony would not have been possible without the knowledge and determination of Elena. She helped us find a stunning Catholic Church in Florence. It was not an easy task because there are only a few churches that allow out-of-town parishioners to marry at. We really appreciated her help to navigate the local Diocese. Finally, our wedding day and reception were straight out of a fairy tale. Chiara and her team arranged the most magical and stunning reception any of our guests had ever seen. The venue was spectacular, the food was amazing, the band was super fun and the brunch the next morning was not only delicious but also the perfect opportunity to relive the night with our guests. If you are looking for a team with the right combination of knowledge, connections, creativity and responsiveness then you cannot go wrong with Weddings in Tuscany. Chiara and her team are all very nice, easy to work with and work extremely hard to satisfy their clients. We’ll remember our perfect wedding for the rest of our lives! It’s been a few weeks, but the memories have far from faded… you truly helped create the best days of our lives! Thank you for all your help in making an elaborate event, with so many moving parts, such as smooth and organized process. You checked every detail, leaving no stone unturned, turning our vision into reality. And when things didn’t go as planned (like the weather you were such professionals. Thank you for your patience, your good humour, and your creativity. You and your team are amazing, and so are all the vendors you recommended. Planning this together was such an amazing journey, and we honestly wouldn’t change a thing! Thank you so much for making our dream wedding in Tuscany a reality. And in reality, it still very much feels like it was all a beautiful dream. Your attention to every detail around the wedding and reception was amazing, and all of your hard work resulted in our special day running so smoothly that it appeared to be truly effortless. Thank you also for providing us with such excellent options and recommendations in relation to the wedding suppliers – our chosen venues were simply perfect and the photographers, entertainment, catering (which was superb) and service staff all worked extremely professionally to provide us with an unforgettable wedding experience in Florence. And I don’t know how you managed to arrange two days of beautiful sunshine and clear nights for us in late December in Florence, but (given what you did for the rest of the wedding) I’m not surprised you could. When Sean and I got engaged looking out at the incredibly picturesque blue mountains in Australia, we knew we just had to have similar breath-taking views on our wedding day too. After a little research, Tuscany stole our hearts; the beautiful outdoor weddings with the rolling Tuscan hills as a backdrop… we knew it had to be ours. Seeing as neither of us speak any Italian we decided to employ the services of a wedding planner to help us out. Chiara at Weddings in Tuscany was the very first planner (or, fairy godmother as I now refer to her) that we had the privilege of speaking with, and she was the last. After having spoken to her at length on Skype late one evening, we knew that she was ‘the one’ as she knew exactly what we wanted before we’d even said it – she literally finished our sentences for us! The whole experience with both Chiara and Elena, from that initial Skype chat to The Big Day was flawless. They run an amazing company, where nothing is ever too much trouble and no question is silly. No word of a lie, I would often wake up in the middle of the night with ideas and questions bouncing around in my head and ping them over straight away… in the morning, I’d usually wake up to a reply from Chiara answering all of my questions and approving most of my bizarre ideas. The wedding day itself was absolutely perfect and we couldn’t have asked for more. The weather was perfect, the villa was stunning and it was all down to Chiara and her team running everything so seamlessly. We barely even knew they were there – except for a special moment Chiara and I shared before the dancing started, one which will always bring a big grin to my face! This woman knows the best vendors (the catering was INCREDIBLE), the most perfect settings and gave us the biggest and best party we have ever thrown. I doubt I would ever be able to top Chiara’s work and I would highly recommend Weddings in Tuscany to anyone, no matter what your budget or your vision. She will create the perfect, most amazing day for you and your partner. Ours will certainly be remembered by us and our family and friends forever. We can not say thank you enough for all your hard work on making our wedding day so perfect! You helped take our vision for the special day and created something even more beautiful. The day could not have been happier, from the stunning setting, beautiful flowers, and sunset over Florence. You truly made our wedding day special for every one of our guests who made the trip. Thank you both for the countless emails and Elena for coordinating so many moving parts and our gorgeous religious ceremony. We hope to see you both again next time we are in Italy! Chiara, thank you for all that you did to make our wedding a reality. Hundreds of emails , many WhatsApp, your patience and love are much appreciate. We will miss you were a huge part of our lives. We have just come back from our holiday in Italy. I just wanted to say a big thank you for helping us with the wedding planning – all those endless emails clarifying details and preferences, Skype calls…. I felt very relaxed and peaceful on the Saturday – and I know you helped to sort out everything in the background, with the vendors and with Luisa. I don’t know when we will meet again – but you were an integral part of our celebration. Thanks for taking the journey with us! We wanted to thank you for all your help making our wedding an unforgettable day! It is definitely challenging planning a wedding so far away, and you and Elena made us feel comfortable and always answered all our questions. Your recommendations on catering and our photographer were fantastic! Nicoletta Pavesi is by far one of the most amazing photographers I’ve seen. Being a Makeup Artist myself here in Canada, I see a lot of weddings and photography and yourself and Nico are amazing! My wedding table set-up was exactly like I had hoped for from all the photos I sent you. La Poggiolia was the perfect setting for our magical Tuscan wedding. Everything came together beautifully and it’s a day we will never forget! Thank you for everything, we couldn’t have planned it without you. Elena and Chiara, I want to thank you so so so much for everything! The ceremony, reception, photo/video were all splendid! The music was fantastic. And hair and make up were just beautiful! All of our guests had a great time , and they were very impressed! For that,we really are grateful that we had your help through this journey! You’ve been more than amazing. Thank you so very much! Sincerely Jenn and Adrian. We hope you’re both well. We just wanted to say thank-you again for helping us organize our wedding. We’ve been reflecting on our year and how perfect our wedding was and we have you both to thank for that. We couldn’t have wished for it to be better. It really was a dream come true! We’re so happy we contacted you both back in September 2014 and chose you to help us organize our wedding. You were both so organized, always responded to our constant questions and knew exactly what we meant when we told you of an idea we had in mind. We are so grateful for all of your hard work. You took a lot of the stress out of planning a wedding. We would highly recommend you to anyone who wants to get married in Tuscany. So many of our friends have told us that it was the best wedding that they have ever been to and we think that is down to your help. Elena was also amazing on the day and made us feel very relaxed. Elena did so well with the complicated table plan that we wanted! It was exactly what we imagined. We hope you have a lovely new year. Thanks again for helping us plan the most wonderful day of our lives – you are both brilliant at your job! Chiara, thank you so much for all the effort, help, advise and care you gave to our wedding, I never expected to have such an amazing day, everything was smooth and perfect. Since the beginning you helped us find the perfect venue, super good and responsible vendors, and you gave us the confidence of knowing that even that we where far away you where taking care of everything as if we where close, thank you for all the e mails in the middle of the night, the skypes at every time, the calls, the over and over questioning!!! 🙂 I must say if I had to choose a wedding planner again I will choose you no doubt!!!! Thank you so much!!! Come visit us in México!!!! Zaira y Ricardo. Gracias Chiara!!!!!! Hi Chiara and Elena I cant believe it is already two weeks since the wedding; time has flown by and now we are back home and settling into normal life. We are now preparing for Grace to start school next week – that is our next big family event! I wanted to find a quiet moment to think about the wedding and to thank you both for providing us with such a special day. As you know, 11th August was our 20th anniversary since we first met. It has always been a special day for us and now it will have even more meaning and cause for celebration. Everything on our wedding day was perfect – that was the word we used most often on the day; how perfect everything was. It was exactly as we imagined but never really believed that it would be so good. Certaldo and the villa were spectacular backdrops to the ceremony and reception – the perfect Tuscan setting – and our guests were so impressed by the scenery, the history and the friendly welcome of the people we met. We did not get a chance to thank the staff from Bar Boccaccio but they were fantastic and we loved that they decorated the drinks table with flowers – we were not expecting that. Special thanks to Roberta and her catering team – the quality of the food and service was perfect; again our guests commented on the fabulous food and the friendly and efficient service. Grace sends a special thanks for allowing her to help out with the desserts! Of course our heartfelt thanks to you both! You gave us our dream wedding and that is the best thing I can say. It was not a big wedding, or spectacular but it was exactly what we had talked about for years – it was as if we had described it to you in perfect detail! Our day was filled with love, excitement, good food, music and laughter; all the elements for an unforgettable wedding. We were surrounded by the people we loved and the most beautiful scenery imaginable (and in Ireland we like to think we have the best countryside scenery!). Thank you for making that happen for us. We will certainly be back, we miss Certaldo already! If there is anything we can do for you – reviews, photos etc please let us know. Good luck with all your future weddings – what a wonderful job you have! Best wishes Elaine, Paul, Grace and Emma. Elena and Chiara, I honestly cannot thank you enough. Everything was perfect, I could not have asked for a more perfect day and weekend. It was the most beautiful wedding I could have ever imagined, I didn’t even know it was possible for it to be this gorgeous. Thank you for everything. You’re truly amazing at what you do and I can’t thank you enough. You made it everything it was and I was completely stress free. Everyone had the most incredible time. Even the rehearsal dinner and vineyard tour were completely breath taking. I don’t know how to thank you properly, just thank you, thank you, thank you!!!! I can’t wait to get the pictures to share with you 🙂 Let me know what’s the best way to recommend your services to everyone who needs a planner in Italy! Anyone would be SO lucky to have you! Ciao Chiara, Hope all your weddings are going well this summer! We wanted to share our heartfelt thanks to you and Elena again for all your help and support leading up to our big day. We had the most wonderful day (despite the unbelievable heat), as did all our guests, who were totally blown away by the incredible setting, delicious food and indulgent treats and activities we planned the gelato van was a highlight! Our all guests told us how beautiful the church ceremony was and how much they enjoyed it. They thought the church itself was really special it looked just magical with all the candles lit and the choir was the icing on the cake I’ m so glad we chose them as they sang beautifully and brought an amazingly joyous atmosphere to the day as well as a few tears! Our guests had nothing but good things to say about the food both the quantity and quality was exceptional, as was the delicious wine. The attentiveness of the catering staff at dinner was fantastic and kept our plates piled high and our glasses full so everyone was happy! The aperitivos went down particularly well I think we depleted Prosecco stocks very early on what did we tell you about how much British people love to drink!! All our friends have told us it was the best wedding they have ever been to, and we can only agree. We had a truly unforgettable day and much of this we owe to you grazie mille! Elena / Chiara Just a quick thank you for all your help with our wedding. We had a fantastic time and can’t wait to see the photos and video. Please also pass on our thanks to Francesco, Letizia and Elena. The dinner cooked by Letizia was absolutely excellent. I wish you both well for the future! Jade & Colin. What can I say, it’s hard to fit into words my gratitude for Chiara and her team. Chiara was not only our wedding planner at the end of our wedding day but a true friend for life. I miss our almost daily emails!!! Her dedication, hard work, thoughtfulness, and understanding of me and my expectation for our day was really unbelievable, she responded to every email, every Skype request and never moaned or complained (and I emailed a lot!!). She managed my expectation and delivered the most beautiful day. Friends and family were overwhelmed at how perfect it was and I can honestly say our wedding could not have gone more smoothly (apart from maybe the rain in the morning but Chiara even believed that would stop and she was right)! I would never hesitate to recommended Weddings in Tuscany, they are truly the team you need to get things done for your wedding in Italy and their amazing ness keeps you calm even in the most stressful times. As a controlling perfectionist I’m not always easy to keep happy as my new husband knows (haha) but Chiara fulfilled our dreams beyond expectation and Elena did an amazing job with the ceremony. Thank you from the bottom of our hearts doesn’t feel like enough. We will forever treasure our time with Chiara and the team and our wonderful wedding day too of course. Please contact me via Chiara if you want a reference. Dear Chiara, we can’t thank you enough for helping us create the wedding of our dreams. Every part of the day was perfect, our imagination & dreams made into reality! We really appreciate your kind & calm personality as we made our way to & through the wedding day. Thanks for introducing us to this magical place & for everything you did for us. We would not hesitate to recommend Weddings in Tuscany to anybody considering marrying in Italy. From our first point of contact with Chiara we received an immediate response, all questions were answered fully and nothing seemed too much trouble. Our wedding day was perfect, the florist, videographer, photographer and violinist selected by Chiara were excellent. Tuscany is very beautiful and with the help of Chiara and her team your wedding day will be everything you have dreamed of. We had the most amazing wedding at the Villa – better than we could have ever imagined. Chiara and Jo were fantastic to work with in the run-up to the big day and were brilliant on the day itself. We were both so nervous before the ceremony started but Jo was so bubbly we all relaxed. Chiara’s local knowledge and contacts were excellent. All her recommendations for vendors were first class – the venue (the Villa and the fantastic Francesca & team), the music, the flowers, the photographer and videographer, accommodation – there were no disappointments. Ourselves, our families and our guests have so many happy memories from the entire weekend – there is no way we could have done it without you. Mille Grazie!!! Dear Elena, We just returned home this past Sunday and Steve and I just wanted to thank you again for arranging our wonderful wedding. Everything worked out perfectly – even the weather – and our dinner at the restaurant was amazing. The wedding cake was delicious and we were treated so well by all of the staff. It is hard to believe it is all over now but we have wonderful memories and hopefully some day we will come back and celebrate an anniversary. We loved Tuscany – it was our favorite place and wish we had spent more of our time there. Again, thank you for all of your work. We really appreciate it and if we know of anyone that plans on getting married in Italy, we will definitely recommend Weddings In Tuscany!! From our first contact with Chiara, and until the end of our reception, we had nothing but a great experience with Weddings in Tuscany. No detail was too small for Chiara and Elena, who both went out of their way to make our day special and run smoothly. The minister Mara was phenomenal. Chiara’s knowledge and dedication opened up resources to us we never dreamed of and made our wedding seem like a fairy tale. All of her recommendations were wonderful from the hotel accommodations to the beautiful castle where we were married. We highly recommend Chiara and her team to anybody thinking of getting married in Italy. To anyone thinking of getting married in Tuscany, Imagine your dream wedding, Imagine idyllic settings, Imagine having everything the way you want it, Imagine having no stress… imagine Chiara and Elena. Their knowledge and experience guided us through the whole process (of both the ceremony and legal side). It was so reassuring to know there were two people who had taken care of the finest details with 100% confidence. Chiara’s excellent repertoire of vendors ensures that you are guaranteed the best of what you want from Photographer, Florist, DVD etc. To you both. We can not put into words how grateful we are to you both for all your help. You gave us the perfect wedding day and memories we will treasure for a life time. Dear Elena & Chiara, Thank you so much for making our wedding so amazing. I had the best day (and week) ever. Please thank Convivium for us – they were amazing! Our guests were blown away by the cheese & meat corners and the main meal and absolutely loved the ice cream cart – the waiters looked great and the service was impeccable. Awesome. Find attached a little photo of me and Ben that a friend took – I can’t wait to see the professional photographers shots. I hope you enjoyed the day too and you liked the Molton Brown presents. Good luck with all your other weddings this year and we will not hesitate to recommend you to our friends. Thank you very very much again, that you helped us to have this unbelievable wonderful wedding. Chiara thanks for all you did to give me one of the most special days of my life!! It was so beautiful and more than I could have possibly imagined! And all my guests keep telling me how strange it was that there were no little problems and how everything went so perfectly and smoothly! So thanks a million times for your beautiful work! I will never forget it!!!! It seems like I woke up from a dream the day of my wedding. As I stood outside our villa and walked down the grass to the edge where the olive trees where, I gasped at how stunning the rolling hills full of vineyards glistened in the morning sun. And I couldn’t believe that in a matter of hours, I would be looking at that same view standing next to my husband-to-be and uniting our love in front of our family in Italy! (Which is a long way from our California home land) But we made it! And our family joined us in our unconventional ideas of a perfect wedding. Thanks to the help of Chiara, our wedding planner, the entire wedding process was stress free for me. Everything was perfect. From the ceremony, to the family style seating at dinner, to the great band that kept us dancing all night, our wedding was an amazing experience neither I nor my family will ever forget. Thanks Chiara, couldn’t have done it without you! I have been meaning to email you for a while now to say thank you to you and Elena for all your hard work with planning our wedding, everything was perfect and all of our guests really enjoyed their time at La Borriana. Dear Chiara, Thank you for all your help in planning our wedding at La Borriana on 30th July. We could not have hoped for a more perfect day. The setting, the flowers, food, even the weather, everything was wonderful. You are indeed a very talented lady. Thank you again. Dear Chiara and Elena, So…thank you so much for a successful wedding. I regretfully was so worried on the day (and before) that it took a very long time for me to settle and realize it was all happening. But when I arrived at this moment I was so pleased. Father Chris was perfect and the tenor sang beautifully. The reception was much more than I expected. I’m so happy you talked me into the cake and the torches. The food was amazing, people are still talking about it. The service was was exceptional. Dear Chiara & Elena, Hoping you are well. We have arrived back in Australia and it is nice to be home.We had a wonderful time in Italy seeing your country, it is so beautiful. I have to thank you once again for our most beautiful wedding it was far much better than I expected. I loved my bouquet of flowers I have never before seen such glorious roses. If you would like I can write a recommendation to add to your weddings in Tuscany web site as I just think your the best. Once again it was the best wedding ever. I LOVED IT. All thanks to you. Hi Chiara… Many thanks for helping to organize our Wedding Day. We had such a wonderful day. It was perfect. It was the best day of our life’s and it couldn’t have been any better. Everything from the amazing flowers, the table setting, the candles, the waiters, the food and the clear blue sky you promised will appear on the day ( wink wink ). Without you two it couldn’t have been possible and you really got what we wanted in to the single details. We would recommend you to anyone and everyone how is planning to get married in Tuscany. We are still waiting for the photo’s from the photographers but here is two our friend took. Ciao Chiara and Elena! Tom and I just wanted to send you an email to say a big thankyou to you both for everything you have done for us. Your help in organizing the wedding over the last year has been amazing, and we literally couldn’t have done it without you. Elena – the help you provided with the paperwork was amazing and we cant believe how smooth everything ran when we arrived in Italy. The flowers, were absolutely perfect, I loved them so much and was so sad I couldn’t bring them all home with me after the wedding!! The ceremony was just how we wanted it and we thank you so much for helping make it a reality. Chiara – thank you so much for your guidance from the very beginning with everything and helping us organize the guitarist and photographer and decorating the farmhouse on the big day. The guitarist was again, perfect for us and did everything we requested which made it so personal. The photographer was also amazing. Everything ran so well on the day, there was not a single problem and because of that we were able to enjoy our day and everyone had so much fun! It was because of you both (and the wonderful tuscan setting) that our wedding was a massive success, and every single person who went commented on just how amazing the day was, and that it was the most wonderful wedding they had ever been to! We cannot thank you enough, we wish you both all the very best. Dear Elena and Chiara So…thank you so much for a successful wedding. I regretfully was so worried on the day (and before) that it took a very long time for me to settle and realize it was all happening. But when I arrived at this moment I was so pleased. Father Chris was perfect and the tenor sang beautifully. The reception was much more than I expected. I’m so happy you talked me into the cake and the torches. The food was amazing, people are still talking about it. The service was was exceptional. Hi Chiara and Elena, We just got back from our honeymoon and wanted to thank you for helping us make our day so special. Everyone had a fantastic time, things ran smoothly, and the location/decorations were beautiful. We cannot believe we are back from the most amazing wedding ever and that it was our own!!!! Thank you so much!! Hi Chiara and Elena! We’re back from our honeymoon and wanted to send you both a message to say a huge thank you for how wonderful our wedding was and how perfectly everything ran on the day. It was an absolutely magical day and so much more than we ever imagined! The guitarist added a really beautiful touch to the ceremony and the restaurant was fantastic – the food and service were both exceptional. Loved the flowers too! Please pass on our thanks to all concerned. Elena, enormous thanks for the help with the paperwork and for translating at the ceremony – it took a huge weight off our minds to have it all go so smoothly. Everything was absolutely perfect and it was without a doubt the best day of our lives – we will never forget it. We are already planning an anniversary trip back! So, thanks again for everything you both did to make our wedding so memorable – it’s hard to put into words just how special it was. Finally, our accommodation in Siena was fantastic (- if you have other clients getting married in Siena and looking for a similar place to stay, we’d definitely recommend them. Also, we really liked the photographers – it was good fun and they worked hard to get us to relax in front of the cameras! Hope you are both well and our very best wishes! Dear Chiara & Elena, We can’t thank you both enough for all your help making yesterday so special. Everything was fabulous from the ceremony to the food, flowers, tables and even the weather in the end too! We had an absolutely perfect day as did all out guests! We will send you some pictures when we get them! Hi Chiara, We are finally back home in the United States and Frank and I want to thank you and your team for giving us the wedding of our dreams! Everything exceeded our expectations, and we had our dream wedding! Thank you for your patience and help to give us everything and more that we wanted for our special day! Thank you again for everything you and your team provide for our wedding. Chiara and Elena, We have been so busy moving and adjusting to married life, we haven’t had a free moment to breathe! We wanted to say thank you so much for helping us throw the wedding of our dreams. Our friends have not stopped talking about it! Thanks to all the work done by you, we had nothing to worry about but to show up and have a simple, elegant catholic wedding, and then a raucous party with our 40 nearest and dearest. One of our friends recently got engaged and asked for some wedding advice. We told her go abroad and let some excellent wedding planners handle it for you! We couldn’t have been more pleased, thank you for everything. Chiara I hope you are well. We arrived home on Sunday back to normality today. :) Firstly thank you so much for making our wedding day perfect. We can’t predict the weather but yourself and your team adapted fantastically. Music was fantastic and all our family really enjoyed the wedding. Ciao Chiara Thank you so much for all your efforts to make our wedding to a marvelous day. We were very pleased with all the arrangements. Our wedding day was perfect all the way! Chiara and Elena were so professional during all the months of preparation preceding our wedding that they had our complete trust. Then, we could enjoy every moments of our wedding day. Chiara and Elena took care of every details to make it an unforgettable day. Because of them, we realized the wedding of our dreams. We are so grateful for that. Thank you. In planning our big day in Italy, Chiara and Elena were absolutely fantastic in helping with everything, from initial planning, right down to the details as well as all translation and legal requirements. We certainly could not have planned such a fantastic day without them! The service they provide is first class, entirely professional, always willing to help with a smile and listen to all concerns that arise during the planning process There are no hidden extras in the service they provide, and could not have served us any better as “planners”. One of the main motivations for us for getting married in Italy was FOOD!! 🙂 We can honestly say that the caterer suggested by Chiara (http://www.cateringroberta.it/), produced arguably the best food we have ever eaten!! and the service they provided was absolutely flawless. Similarly, the videographer recommended by Chiara (Tommy from Studiobonon) was a great pleasure to have around on the day, and we ended up with fantastic footage and have kept in touch with him as a friend. THANKYOU!! Chiara and Elena for everything. Hi Chiara and Elena Hope you are both well. Jason and I are now back from our honeymoon, a very well deserved long break 🙂 We’d like to thank you both for helping us organize the most special day of our lives. It was magical and thankfully all came together in the end. Thank you for working with us and being patient with us through the stressful moments. Ciao Chiara I wanted to thank you for the perfect work you have done. It was a very important event for us. We took the bet not to come before and trusted your recommendation. All was perfect. Thank you for having make it able to give to agne the dream wedding she wanted. Also all our guests are communicating between them and say that our wedding ranks amongst the very top best wedding they have been. We want to thank you Chiara for giving us the wedding of our dreams. Wedding’s are NOT easy to orchestrate due to the emotions running high and people being tense and wanting to have everything perfect for the perfect price! But somehow you managed to understand our needs, push for the very best for us, get prices down, and still get from it a picture perfect experience that was the moment of magic I had longed for my entire life. You worked so hard, you were always available, always ready with a smile and you never, ever let anything ruffle you. You picked the right caterer to reflect US, a FANTASTIC DJ, and the most divine flowers and decorations which people are still raving about. Thank you for being the steady hand, and the force behind the scenes that pulled it all together. And for being such a classy, straightforward lady that deserves all the respect. I recommend you to any couple looking to get married in Italy. Thank you very much Chiara and Elena for helping us arrange a dream wedding half-way around the globe! It was certainly the most memorable wedding for many of our friends and family from all over the world. The setting was beautifully chosen and our trust in your recommendation was by far the best decision we ever made as the castle was beyond breath-taking. The service we received from you was outstanding. From my very first email exchange with you, I knew that I had made the right decision in choosing weddings in Tuscany. You and Elena were both extremely helpful and efficient in helping us through the paperwork and planning process. The package you created for us was exactly what we were looking for and we appreciated the opportunity to have something tailored to what we wanted. Although our wedding was very small, Planning a wedding in a foreign country can be stressful but all of the choices and suggestion you made were perfect and you took all of the stress away. I was always confident that everything would be perfect and it was. The venue, dinner, cake flowers, and photographer you chose exceeded our expectations and we are forever grateful for everything you and Elena did to make our day amazing! We found Chiara and Elena through Chiara’s blog and read some great reviews from the previous couples she helped. Because my fiancè and I both lived in different countries (neither of them being Italy) and neither of us spoke Italian, having Chiara help us out was essential. She and Elena were extremely easy to work with and made everything as stress-free as possible for us. Chiara was very responsive via email and/or skype and helped remind us what we needed to think about in what order. She had great advice for vendors without pushing us to choose any with whom she’d worked previously. This gave us the freedom to make decisions that were important to us (e.g, photographer/flowers) and let her expertise guide our decisions on things we weren’t as picky about (e.g., DJ). Elena was extremely helpful with all of the legal paperwork. She reminded us what we needed to do in our home country prior to the wedding and met us several times the week of the wedding to work out everything we needed to do in Italy. They were also incredibly helpful with organizing accommodations and events for our guests during their visit. We had a wonderful pizza party the evening before the wedding and took a bus tour to a couple wineries the day after the wedding. The guests were all extremely pleased and complimented us on our organization and ability to coordinate all of these activities, but it was really thanks to Chiara and Elena’s hard work. If you’re having a destination wedding in Tuscany, hiring Chiara and Elena is worth every penny! Thank you again to you and Jo for everything! The entire wedding turned out even better then we could have ever imagined! Our guests keep telling us that our wedding was like a fairy tale!! Thank you for being so patient and responsive to us during the year or so of planning! Although I originally wanted to have the dinner outside, I am so happy we had the dinner in the cozy banquet room of the castle! It was so intimate and perfect!We are looking forward to going back for a special anniversary and will let you know when we are in the area!!! Our wedding was a dream come true, it was like as if we blinked our eyes and we woke up from a dream. Your attention to detail and fine taste in everything made our dream a reality. We cannot thank you enough for everything you have done for us, including the paperwork, all the details involved, we could not have done this without your expertise. We would recommend to anyone who is getting married overseas or local to use “Wedding’s in Tuscany” for all weddings, large or small, the outcome will be perfect. We had the time of our lives and we will cherish our wedding for the rest of our lives! We love you so much. Thank you on behalf of everyone, we are deeply moved by our experience. You and the team at “Wedding’s in Tuscany” have touched so many lives with your fabulous & Impeccable work! Dear Chiara and Elena, I hope this e-mail finds you both well. We would like to send you both our heartfelt thanks for all you have done to make our wedding day very special. We had a lovely day, everything was perfect and La Borriana was the ideal place to have our intimate wedding. So thank you! We hope to come back to La Borriana some time in the near future and also with the children. We thought the ceremony itself was also very nice and and extra special reading the poem at the end – thank you for the translation Elena. Take care, we hope to meet you again sometime in the future when we make our return journey. Hi Chiara, I am so sorry I haven’t been in touch since the wedding, Paul and I have been so busy, I thought it was supposed to be quiet after the big day! Thank you so much for everything, the day was amazing and everything was perfect, more than we could possibly have hoped for. It was all so easy, people kept saying it is very stressful organizing a wedding, but I have to disagree and I think that had a lot to do with you and the staff at Artimino. All of our friends were wowed by the day, the venue, the food, the weather and the music, I have never seen people go so mad on a dance floor. Some friends have described it as like a “celebrity wedding”, maybe a little over the top, but it definitely had the wow factor. Both Paul and I loved every minute and we are planning to come back for our anniversary next year. Thanks again, and hopefully see you next year! Chiara and her team were irreplaceable when we decided to get married in Tuscany. We flooded her with numerous questions over several months. She always took the time to answer each one, despite how silly the question was, and as a result, I was able to put complete trust in Chiara as we planned our wedding from afar. Her communication, organization, and diligence undoubtedly were two large factors to help make our wedding day as smooth as possible. Chiara dealt with every aspect as a professional, and each of her recommendations were top notch. The flowers, photographer, minister, restaurant, and musicians she hired to help us were all exactly as we were promised and had hoped. Thanks to Chiara and her team, most of our work for the wedding was arranged well in advance. Upon our arrival into Tuscany, we were able to enjoy our wedding and family without needing to tie up loose ends. Our wedding came together just as we envisioned, and without Chiara’s help, it wouldn’t have been the same. We appreciate all she did to help create a memorable and meaningful day for us. Hi Chiara, we have had time to reflect on our wedding with all the guests over Christmas and felt we needed to let you know how much enjoyment everyone got from reminiscing about the time we had over in Italy. All of our guests think it was the best wedding they were ever at and most of that is down to you. We placed all of our trust in you and you not just met those, you exceeded them. Everything was better than we could have imagined, from the accommodation, the beautiful location, the church, the food and especially the wine, oh and of course the tiramisu! After having that, we spent the remaining three weeks of our honeymoon trying to find a tiramisu to beat it and we couldn’t. Some of our guests loved the wine at La Borriana so much they tried to get it for their own wedding back in Ireland! You were always quick to respond when contacted in the run-up to the big day and we always felt assured that any problems that arose you would handle promptly. On the day you and Patty were very calm when all around you and were always there with a quiet word of assurance or advice. We would recommend you to anyone who is thinking or getting married abroad. Hi Jo and Chiara, Nial and I are coming back to earth with a bump after having such a magical week staying at the Fattoria and having such an amazing wedding. What can we say? . . . We cannot thank you both enough and we truly appreciate the time and effort you have spent organizing our wedding, Im sure at times it was a nightmare for you both. However it completely went over any above any expectations and dreams we both had, I honestly mean it. All our guests are wishing to return in the not too distant future, in fact some are even planning a first anniversary reunion and if we do manage to get back so soon I would hope you would join us for some drinks . . . you deserve them! Dear Chiara & Milva, Finally, we have returned home from our honeymoon in Italy and are now beginning to settle down into married life. We wanted to formally thank you and your colleagues for making our wedding the most fantastic, enjoyable and memorable day of our lives. The quality of service you offered us was always of the highest standard and network of contacts made the whole planning experience much less stressful as we knew our wedding day was in very safe hands. When we decided to hold our wedding in Tuscany we truly did not know where to begin; things like finding a venue, organizing the legalities, sourcing the entertainment and venue for the wedding dinner……and then we found “Weddings in Tuscany” and all our worries just melted away. We would personally recommend “Weddings in Tuscany” and wish you all every success for the future. We hope to make a return visit next year for our first anniversary, so will be in touch and hopefully meet up. Our love and sincere thanks to you once again.